The Biogel Sensor glove is the latex surgical glove of choice when maximum sensitivity and control is required. Ideal for microsurgery procedures that require precision, the Biogel Sensor gloves are roughly 20% thinner than standard latex surgical gloves. 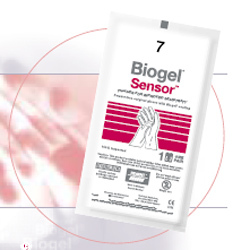 Although similar to Biogel's Super-Sensitive surgical glove, the Biogel Sensor has micro-textures to allow enhanced grip. Handling objects that are wet can be quite slippery and the added texture ensures instruments are securely gripped in your fingers or hands.